And now back to this ongoing project. 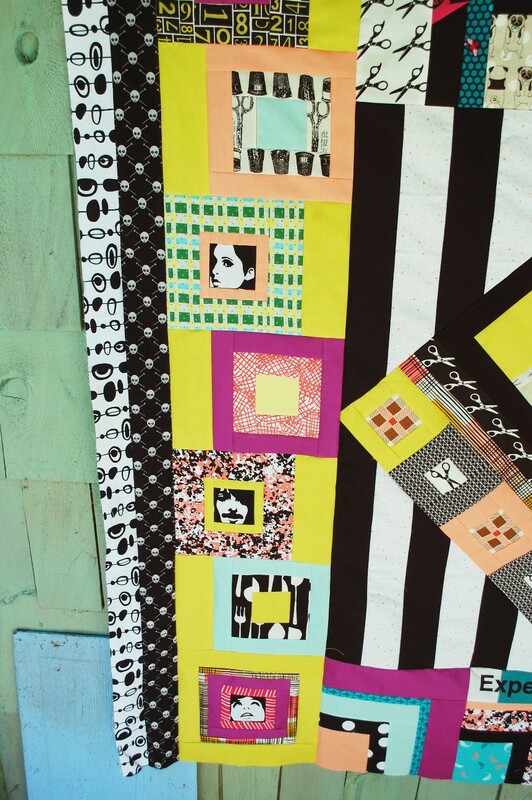 Today’s entry is Christopher‘s Quilt. Below is what came to me after John, Molli, and Nick worked on it — TOTALLY different than previous projects in this fun group. That bit in the center that looks so yellow is actually a Very Chartreuse-y Green. I used one 2 1/2″ square of Highlight in my work and you can barely tell it is different than this green in later pictures. It is a hard color to capture with even a decent camera. 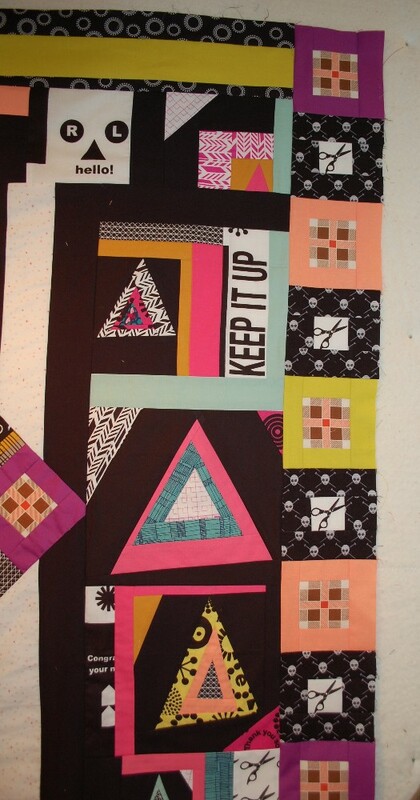 Every time I pulled this quilt out to work on it, I felt that I needed to kick into 80’s Dance Tunes Mode. I think Nick’s triangles are what really took it down that road. 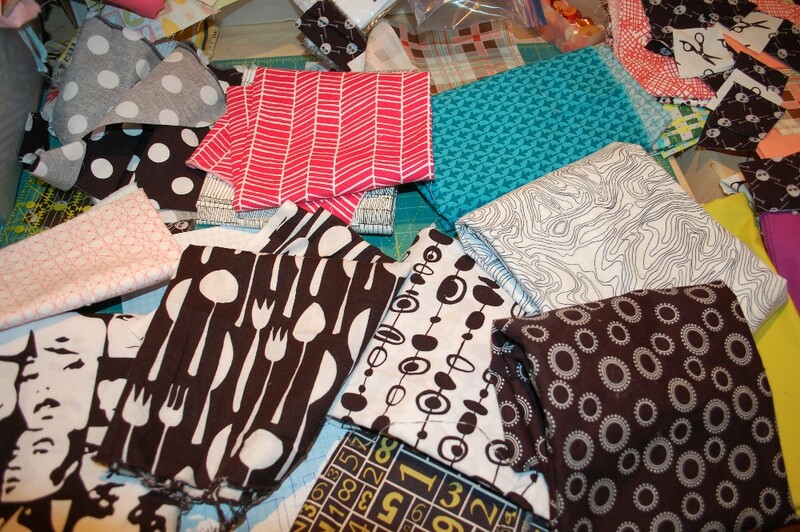 Here are some of the fabrics I pulled when I first started on this — months ago. Some of them made it in, but then others got buried in the piles. That Black & White cutlery fabric actually became kitchen curtains because I was bored with the cherries print we have had up for years! 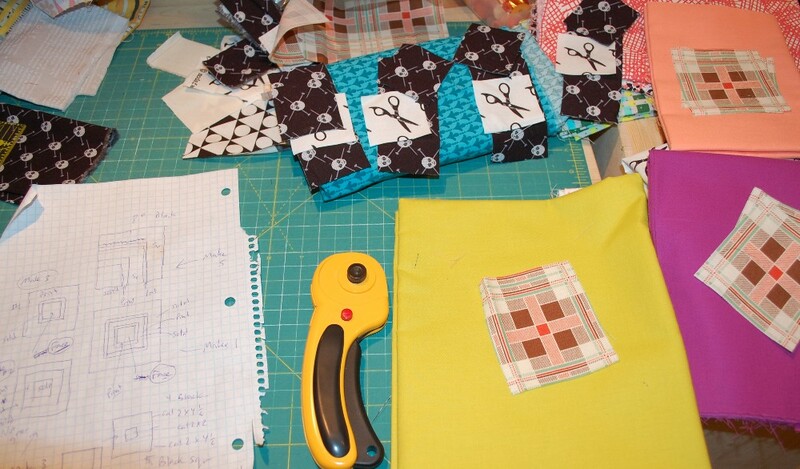 I felt completely compelled to replicate some of John’s fussy cut scissors and plaid square in a square blocks. Both prints came with the package of fabrics that came with the center. They were put in there by either Christopher or John, since John used them (When you are fourth on the list, you are never sure exactly who put what fabric in the box because everyone usually adds at least a little from their own stash). 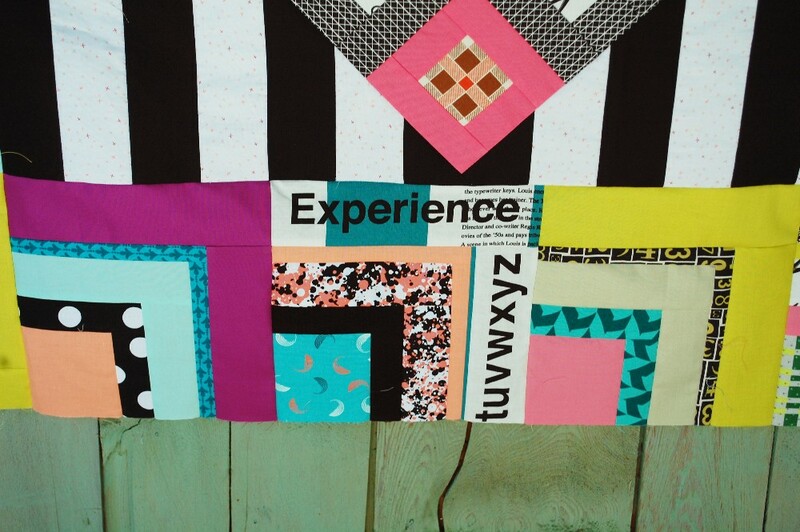 Anyway, the plaid provided a perfectly little finished 2″ square that was fun to work with. 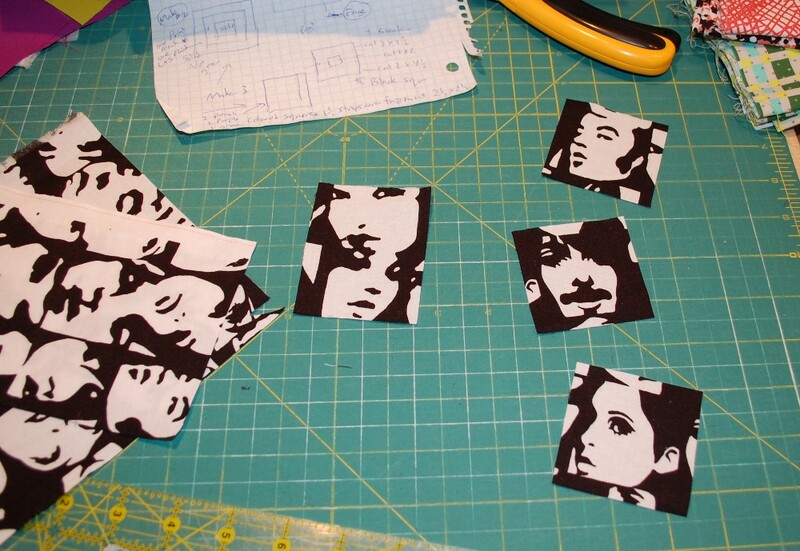 Then I had this UBER cool face fabric and these faces finish pretty darn close to 2″ finished. I LOVE how they framed up in these blocks!! I had them named once. Let’s see, in order: Paul, Karen, and Mitchell. How do those sound?? 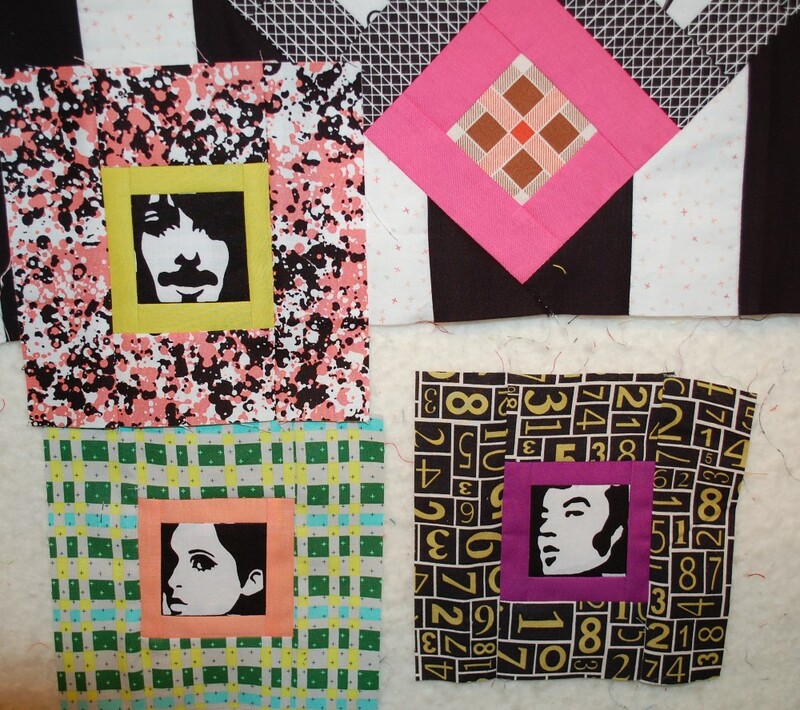 I have been loving working on these quilts with these gentlemen. Only two more to go for me. I wonder where mine is now? That is the one part that makes me just a bit anxious when sending work around like this. What if it gets lost in shipping? So far it has been a great Experience. Each project has such a different aesthetic. And all of the players produce Fantastic Work! 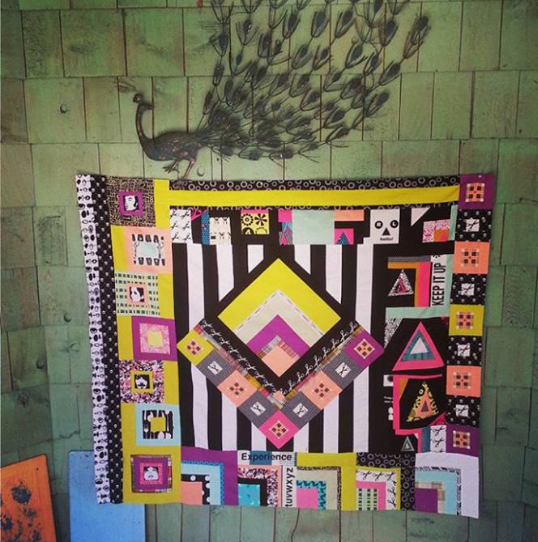 So after all of those teaser shots, here it the quilt with it’s latest round (by yours truly) before it left here. David has it now, making his magic with it. That’s today’s post people! I am slowly getting caught up around here. 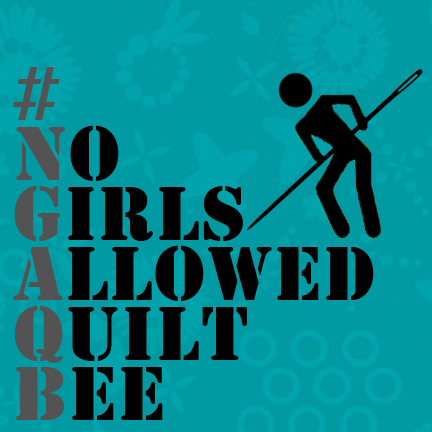 Much more to share. 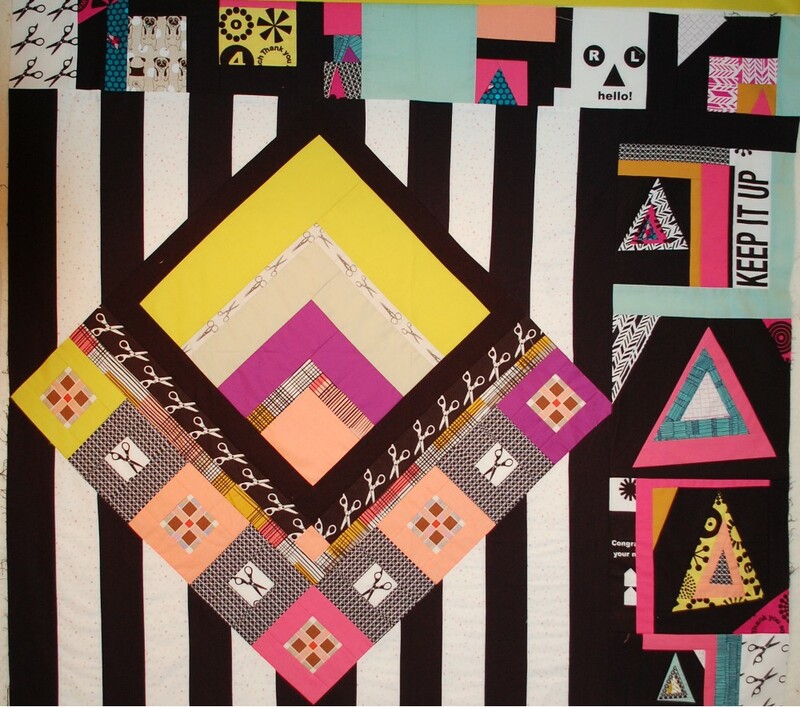 Plus I NEED to get back my Splendid Sampler blocks and posts. Bobbi looks afraid, like something might fall on her! !